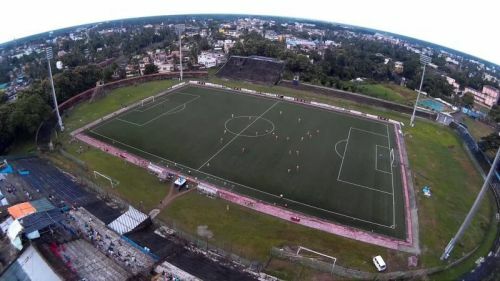 Goals continued to galore in the ongoing IFA Shield as Jamshedpur based TATA Football Academy registered a hard-fought 4-3 win over Bengal Football Academy in a nail-biting encounter today in the Barasat Stadium, Kolkata. Both the teams began the game on a nervy and cagey note with numerous incorrect passes and aimless long balls. As both the teams gradually settled in, both sets of strikers opened up the defences at either side of the pitch to showcase some sublime goalmouth action. Tata Football Academy earned a penalty in as early as the 8th minute only to have it saved by the Bengal Football Academy custodian Surajit Pramanik. However, Tata Football Academy did score half an hour later in the 38th minute through Kilong after a clever freekick. The teams went into the break with TFA leading 1-0. Bengal Football Academy looked a resurrected side in the second half as their frontline wrecked horror for the TFA backline. Constant pressing and wing play from BFA kept the TFA goalkeeper and defence busy for an ample amount of period. Mohammed Sumit, Sudip Das and Jiyaruk Paik scored one each to tilt the game on their side and give BFA a comfortable 3-1 lead. TFA gather themselves up with constant pressure play and long balls over the top, hoping to find their target man to reduce the parity. The academy side of Jamshedpur FC finally got their reward for constant pressure on BFA through Mani Sana's goal from the spot. Sukhlal Konlal equalised for TFA in the 80th minute after he tapped home a cleverly taken freekick. TFA kept on the routine high defence and pressure play on to BFA and scored in the 94th minute in additional time through substitute Chetan Hansdah to send the BFA boys in tears while joy knew no bounds for TFA. TFA will next face Churchill Brothers on 10th July in Barasat Stadium while BFA would cross swords with heavyweights Mohun Bagan on 9th July at the same venue. Will the newly famed BFA trouble the Mariners after a brilliant first game or would Mohun Bagan continue scoring for fun against BFA as they did against Churchill Brothers? Only time will tell. Has Tata Football Academy achieved more or less than its potential?